Seventeen-year-old Prenna James emigrated to New York when she was twelve. But Prenna didn’t come from a different country, she came from a different time – a future where a mosquito-borne illness has mutated into a pandemic, killing millions and leaving the world in ruins. Prenna and the others who escaped to the present day must follow a strict set of rules. Prenna does as she’s told, believing she can help prevent the plague that will one day ravage the earth and take the lives of her younger brothers. But everything changes when she falls for Ethan. She might be able to save the world … if she lets go of the one thing she’s found to hold on to. Thank you to NetGalley and Hachette Children’s books for the advanced copy for my honest review. Upon receiving this book back in November I was in a real reading slump and was only able to pick it up the other night, and y’know? I’m really disappointed in myself for not going with it sooner. Prenna is our heroine from a different and more desolate time. Ethan is the love interest who accidentally witnesses the time-travellers coming four years earlier. This will set you up for the star… sorry time-crossed lovers who have to fight against what has already happened before to set a new course. As an alien into early twenty-first century United States, Prenna cannot reveal who or what she is, nor can any of the other time hoppers in her community. They are constantly watched and monitored. Trapped. Yet nothing will keep out heroine from finding the truth! Ann, effectively creates a strong female lead who knows that something isn’t right and that she is the one to fix it. In Prenna we see strong characteristics of someone who is born to change things, she is smart, confident in what she knows and will always strive to do the right thing. Coupled with the introduction of Ethan, who always stayed by her side even as she tried to shun him makes for an unstoppable duo at saving the future. As time crossed lovers though, there is trials in which they must overcome to stay together. 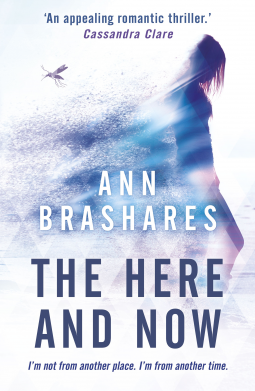 Ann manages the idea of time travel in a vaguely easy to understand manner which doesn’t leave the reader with a sore head and wondering for a few days what they have just read. In fact our author is so adept at this, she introduces multiple time rifts and this skill coupled with her writing ability makes for an easy to read novel that is both enjoyable and a great plot. I was glad to read that last chapter as she has left it open for the sequel to continue from and let the story of Prenna and Ethan evolve and breathe.